Here we are with Page 7 of Priorities. That means, as far as Priorities is concerned, we have just one page to go. This is actually the very first page that Harold and I did. See, we knew how we wanted the story to end, so Harold roughed out the ending to determine how many pages the ending would take. We only had eight pages to work with and based on Harold's roughs, the ending took two pages, so then I had to figure out how to fill in the previous six. So there you go, a little behind the scenes for you. Pulling back the curtain and stuff. I'll use this space to post a few reminders. Reminder #5: There is no 5th reminder! 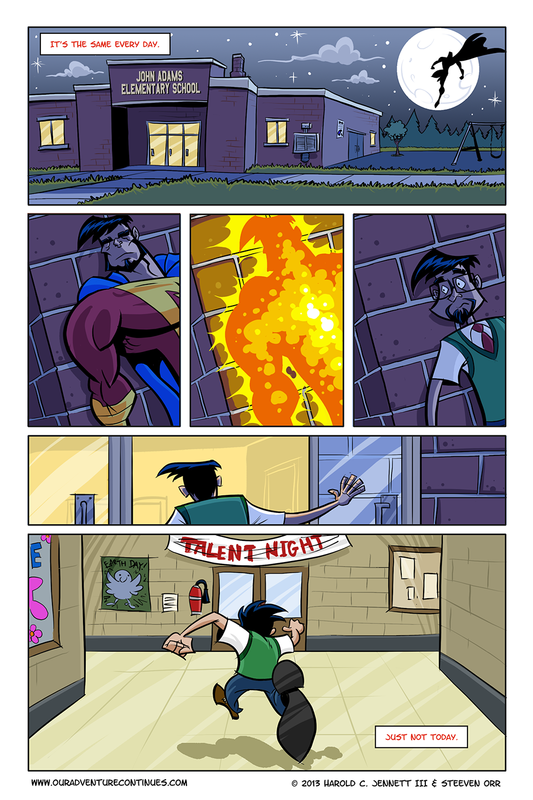 Reminder #6: The web strip will launch the Tuesday after the last page of Priorities goes up. So the last page of Priorities will go up on Wednesday, January the 16th, so that means that the first strip (which we are currently going to go ahead and call Variety Smack) will go up on Tuesday, January the 22nd. So be there for that, because you are in for something special. We have (as I type this) 27 strips completed and in the can, so worry not that we won't have content for you for the weeks to come. I think that's all I have to say this week.